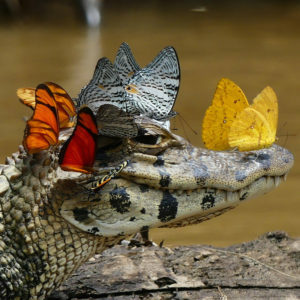 In this stunning image of a caiman with a vibrant crown of butterflies, the water that collects on the caiman’s skin is providing salts and minerals for several species of butterflies. Many species of butterflies congregate on wet sand and mud to partake in “puddling,” drinking water and extracting salts and minerals from damp sand or mud. In many species, this “mud-puddling” behavior is restricted to the males, and studies have suggested that the nutrients collected may be provided as a nuptial gift during mating. Male Swallowtail butterflies puddling along a river bank. Photo by Chelsey Danger. Used with permission. The first time I observed this behavior I was several years ago in Florida. 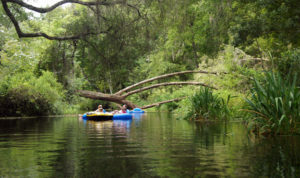 Our family was enjoying a six-mile tubing adventure down Ichetucknee Springs near Gainesville. (The real Magic Kingdom of Florida.) 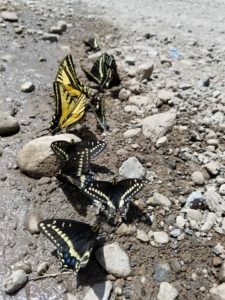 As we approached the end of our trip, I noticed about fifty swallowtail butterflies of various species congregated together exactly where we needed to get out of the river. There was a cement embankment that slid down to the river to make it easier to get out of the water. The butterflies seemed totally oblivious to us as we ascended onto the embankment. I realized that as people got out of the river, water from their bodies dripped onto the wet cement. These butterflies were sipping the salts from the sweat being washed off as people got out of the river. Tubing Florida’s Ichetucknee River. Photo by Robin Draper of Authentic Florida. Another time I experience this phenomenon was at Butterfly World in Coconut Creek, Florida. I was sitting on a bench, enjoying the many species of tropical butterflies inside the exhibit. It was a very hot day and I was covered in sweat. 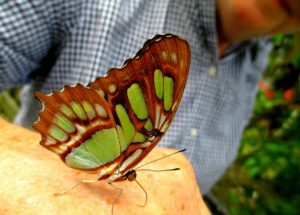 To my surprise, and utter delight, a Malachite butterfly (Siproeta stelenes) landed on my hand and proceeded to stick its proboscis onto my sweaty hand to sip the salt. It stayed there for several minutes, totally oblivious to my camera. This Malachite butterfly (Siproeta stelenes) is enjoying the salt from my hand. 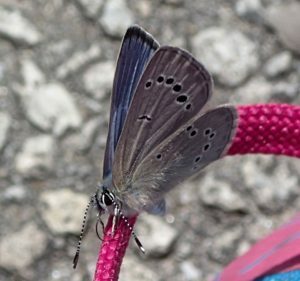 Recently Carol Pasternak, author of How to Raise Monarch Butterflies: A Step-by-Step Guide for Children , noticed a Silvery Blue (Glaucopsyche lygdamus) butterfly on the shoelace of her running shoes. Apparently the perspiration from her arduous workout seeped into the shoelaces providing a tasty treat for the butterfly. Silvery Blue (Glaucopsyche lygdamus). Photo by the Monarch Butterfly Crusader, Carol Pasternak. Used with permission. 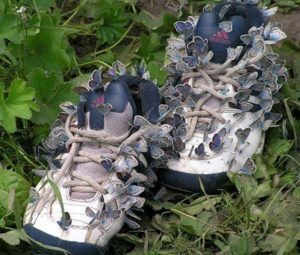 Who knew that old sweaty shoes would attract so many butterflies!